It was with great anticipation that Vienna Cricket Club made its way down to Seebarn in its search for an elusive 4th open league title. Lords cricket club had performed well all year, and the match promised to be captivating for both devoted supporters and neutrals alike. The first attempt at winning on the grand stage had been thwarted by rain the previous Sunday. The single innings completed would count for nothing, with sumptuous hundreds and truly majestic 4-fa’s forgotten as if they had never occurred. Which brings us finally to the big dance. Much like the previous weekend, Lords would be batting first. The two Lords openers had scored with aplomb throughout the season and were by far the key wickets, and we were expectedly jubilant when big Dan Eckstein (1-34) managed to induce an edge behind from the opposition skipper. Wali (2-47) pounded away relentlessly from the other end as he had all year, and was rewarded as he burst through the defense of the Lords first drop. The VCC bowling continued to plug away, another wicket falling cheaply as the runs were kept to a minimum. After the break the big moment was on the horizon as the smaller, balder Dan (2-36) managed to strike one batsmen plumb LBW. The pressure of the match situation and the falling wickets was telling, as Dan then managed to sneak one through the defences of the Lords opening batsmen, dismissing him for 71 and bringing his total runs against VCC to a paltry 180 in two innings. The remainder of the innings was characterized by some good bowling, some luck for the batsmen, and some sloppy fielding. The always wily AB (2-32) managed to jag a couple, Wali added another scalp, and there was a frantic run out towards the end as Lords finished on 9-198. With the hard work ahead of us, Ram and Big Dan strolled out to the middle. Ram was unfortunately given out LBW in controversial circumstances, and the chase was off to a bad start. Mark SP would follow him soon after, a leading edge popping up to cover. The storm was weathered at first by big Dan, smashing sixes and fours at will on his way to 44- one of his massive sixes flying straight through the middle of the two flag poles. Erwin Grasinger (60*) managed to hold the fort at the other end, running hard and hitting the gaps to keep the target in reach. When the big D experience was dismissed, Pete and AB followed soon after and VCC was truly up against it, or so it seemed. The run rate was rising, and hopes were starting to fade. A captains knock was required, and our glorious leader would provide nothing less as he joined Erwin at the crease. The skipper truly putting on a clinic as he took toll of anything remotely in his area, running hard with Erwin and hitting bowlers off their lines. Erwin was no less dominating, silkily placing the ball wherever he wished and making you wonder if it wasn’t really Michael Bevan out there! Quinton was finally dismissed for 64 with 20 odd to get. Dan Stevenson went out and immediately got to work, with anything even slightly straight easily peeled off. A fat lady was observed on the boundary, but on closer inspection turned out to be a collection of Ally’s empties. Never the less, the match was all but ours. Ervs continued doing his thing, and Dan hit the winning runs with 3 balls to spare. That’s it, we’d done it! Congrats to VCC, open league champs 2018! VCC member Richard Asher describes his experiences with Cricket in Austria. Another glorious sunny day awaited us at Seebarn as VCC prepared to take on ACCW. Captain Dan one again won the toss and ACCW were sent in to bat. Big Dan Eckstein and Wali took new ball, making the opposition batsmen work hard for their runs. Wicky Wali was eventually rewarded with the scalp of the dangerous ACCW opening bat, despite the bumbling efforts of the catching fielder at mid on. VCC continued the discipline shown by the openers, and soon Abdullah Khan had enticed an edge that was stylishly taken by Owen behind the stumps. The Abdullah/Owen combination soon extracted another ACCW wicket, this time from a run out as Abdullah’s rocket arm was too much for the tiring set batsmen. The spin of captain Dan and Ram accounted for a further 3 wickets, but unfortunately some sloppy fielding in the last 5 allowed ACCW to reach 147 at the end of their 20 overs. Abdullah (15) and big Dan Cornerstone (22) opened up, with Dan subjecting the ACCW bowlers to the usually disdain we have all become accustomed to and Abdullah also scoring freely before being dismissed. Erwin (14) and Ram (26) ticked along nicely, however their dismissals brought the end nearer as VCC struggled with the run rate. Captain Dan (11) managed our only other double figure score towards the bitter end. All in all despite a disciplined bowling performance but we were shown how to play by ACCW who were clearly the better side on the day, lots of positives to take into the following games! Also, it was really nice to see players from both sides share a drink together after the game, hard on the field, respect off the field. It was another sensational day for cricket as VCC took on Sri Lanka CC in the first twenty20 game of the season. Captain Dan won the toss and SLCC were sent in to bat. The SLCC came out all guns blazing, but both opening batsmen were dismissed (relatively) cheaply, much to the delight of one slightly ego-bruised opening bowler. Seasoned veteran and all round cult figure at VCC Wolfgang set the precedent in the field, taking a fantastic catch on the boundary at deep cover to send back one dangerous opening batsmen. The blistering pace and bounce of David Clark (1-5) was too much for one SLCC batsmen, causing him to stand on his stumps in what can only be described as the most alpha display at Seebarn that day. With the opposition taking a liking to pace bowling , the much vaunted spin bowlers of VCC were thrust into the attack. Ram (3-16) bowled with tantalising spin and flight, while captain Dan (1-7) pinned the SLCC batsmen deep in the crease, well and truly putting the clamps on. An excellent outfield catch from Abdullah Khan and a wicket for the wily Wolfgang in the last over of the innings reduced SLCC to 127, and it was our game to lose from there. Young gun Mark S hyphen P (22) and batting cornerstone Dan Eckstein (24) opened up for VCC, ticking the scoreboard along and putting away the bad, and even not so bad balls before being dismissed. Abdullah Khan (24) was joined at the crease by frequent contributor Wolfgang (10) who both continued scoring above the required rate with some sharp running between the wickets. With sweet victory in sight, Wolfgang’s dismissal brought Ram (22 n.o) into the fold, who played a measured and composed innings to take us over the line despite losing a few quick wickets. The winning runs were fittingly hit by Captain Dan and the celebrations began. All in all a great day out at Seebarn, VCC much improved in the field and ready to take on the competition! 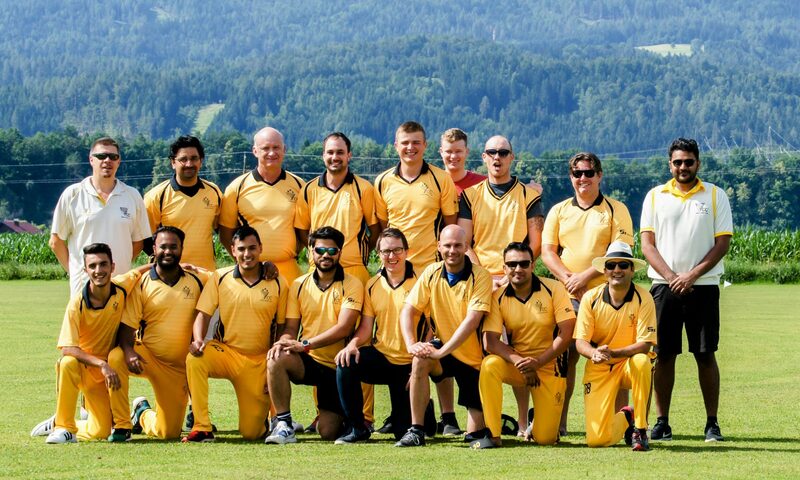 Richard Asher has written a great piece for Cricbuzz about his experiences playing cricket in Austria, as well as about the cricket scene and history of the game in Austria. The full article can be found here on Cricbuzz.